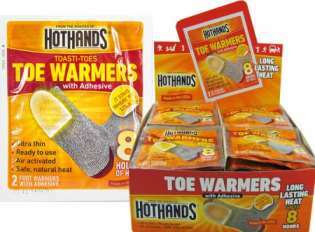 Hothands Toe Warmers counter-top/retail display box. 80 warmers (40 pair) per display. Hothands Toe Warmers are air-activated toe warmers with full adhesive on one side that sticks to your socks to provide up to 5 hours of warmth. Best used by the active sportsman who will be walking or moving continuously while outdoors in the cold. Now proudly made in the U.S.A. Perfect for skates, ski boots, and regular shoes/boots. Adhesive backing keeps warmer firmly in place. Up to five hours of 100F warmth.